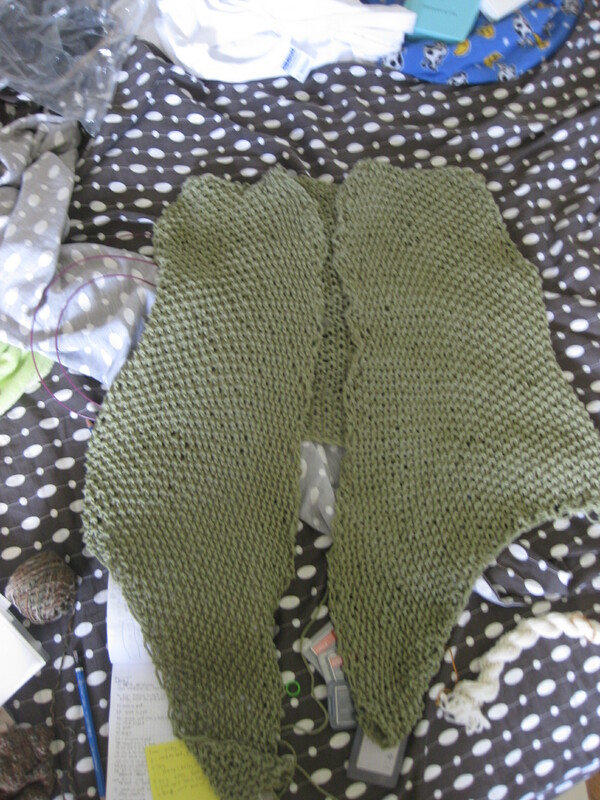 So I started this sweater thingie (I think of sweaters as squishy, cozy things – this is definitely not squishy or cozy) about 2 weeks ago and I knew I wanted something drapey. I wanted something light and summery (which is why it’s not supposed to be cozy). It’s beautiful, light, and airy. I wanted something I could wear when the sun goes down (here in SoCal, it’s still relatively warm when the sun goes down, but I get cold. I’m always cold). And I wanted something netty. This is all of the above. But it needs sleeves! I could just leave it as a vest thing – which it is right now – but I want sleeves. It doesn’t quite serve its purpose as an evening cover unless it has sleeves (at least in my book)! So I had picked up a few stitches for sleeves (I like working things together. It makes me feel more productive) and that wasn’t right; too many gaping holes in the netting. So I picked up from different loops. Too bunchy. GAH. Any suggestions? I really would like to finish this soon….let me go back to agonizing over these GOSH DARN ARMS. Apologies for the lack of updates; this quarter definitely took off running what with 20 units and ultimate frisbee. As it is currently finals week, unfortunately knitting has had to take a back seat. But look forward to a pattern coming next week! My very first written pattern! I’ve discovered a lovely little yarn shop hidden in Claremont village called Colors 91711. It’s a bit on the small side, but I really loved the atmosphere and can’t wait to return! Also, they feature spinning classes so I’m planning on taking that up in the new year! Though knitting is taking a back seat this week, earlier it had seemed that there was a strong positive correlation between the number of knitting projects casted on and the number of deadlines approaching. That is definitely one thing that should be changed. Anyway, with Christmas coming strong and quickly, I have plenty of FO’s to share. First, pictures must be taken and I suppose I need to give them out first so no surprises spoiled. But there definitely has been no shortage of knitting in my life! Good luck to all who are taking finals! As summer winds down, knitting starts to pick up. The race towards Christmas has begun! Well, in my eyes at least. Hopefully the start of school will still allow me some knitting – I guess I can always make time. But my summer FOs have yet to be posted – I’ve had a medium productive summer thus far, getting in two socks (non related), a vest, a hat, . In other news, expect a summer entry soon. There are tons of pictures to be posted, I’ve only just re-ignited my desire to blog. Apologies for the hiatus.